Image from the Hagley Vault Digital Archives. Caption says “Stephanie L. Kwolek, developer of Kevlar (circa 1995). 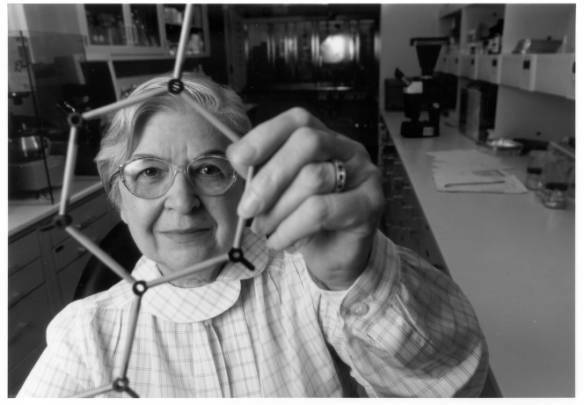 While working with DuPont Stephanie Kwolek developed the first liquid crystal polymer which provided the basis for Kevlar brand fiber.” The New York times reported that Stephanie L. Kwolek passed away Wed June 18, 2014 at the age of 90. See Washington Post article here. Thank you to GGSTEM contributor Jill Tietjen, for the updated post below. Photo credit: National Women’s Hall of Fame. Stephanie Kwolek is best known for her invention of KevlarTM, the lightweight yet very strong polymer used in bulletproof vests and many other products. In fact, when she was inducted into the National Inventors Hall of Fame in 1995, she was escorted to the stage by a policeman whose bulletproof KevlarTM vest had saved his life. Kwolek spent 40 years with DuPont during which time she obtained 16 patents for a variety of groundbreaking materials and devised new processes in polymer chemistry. Kwolek had shown an early interest in science. Intending to pursue a career as a doctor, she graduated with a BS in chemistry from what is now Carnegie Mellon University in 1946. She accepted a position as a chemist in the rayon department with DuPont planning to save the money she needed to attend medical school. In 1950, she moved to Wilmington, Delaware, and became so interested in the polymer research in which she was involved that she decided medical school was no longer in her future. She said “I became so interested in the work I was doing that I stayed on. It was very challenging. It differed from day to day. It was very exciting because you never knew what you might come up with. It was a constant learning process.” In addition to KevlarTM, Kwolek worked on LycraTM spandex fibers used in athletic clothing and Nomex, which is fire resistant and used by firefighters. 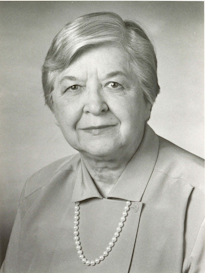 Stephanie Kwolek received many honors. In 1996, she received the National Medal of Technology “for her contributions to the discovery, development and liquid crystal processing of high-performance aramid fibers, which provide new products worldwide to save lives and benefit humankind.” In 1999, she received Lemelson-M.I.T. Lifetime Achievement Award. Kwolek has been inducted into the National Women’s Hall of Fame. In 2014, she was inducted into the Hall of Fame of Delaware Women.